Dubai, before it became the opulent metropolis it is today, was a mere desert land. It is here that the Arabic tribes of the region lived. If you see the present Dubai, it is hard to imagine this scenario. However, it is true and the desert is deeply rooted in the culture and traditions of the Emiratis. Although the desert is no longer the home of the Arabs, you can still enjoy life in the desert during your visit in Dubai. The Dubai desert safari is an ultimate experience, one which you must not miss when you are in the Emirate city. Here is what you can look forward to during the desert safari experience. When you look for desert safari in Dubai, you would come across a variety of them. Evening desert safari, morning desert safari, overnight desert safari, etc. are few of the most popular ones. Then there are adventure desert safaris for those who are only looking for thrill and adventure and dinner desert safari for those who want to enjoy a hearty meal in the peace and quietude of the desert. Camel desert safari, Hummer desert safari, and desert safari with quad biking and sandboarding are few other versions of it. You will also come across hot-air balloon desert safari where you get to go on a hot-air balloon ride over the vast desert of Dubai. While each of the desert safari may offer varied experiences, the excitement of each one of them is the same. 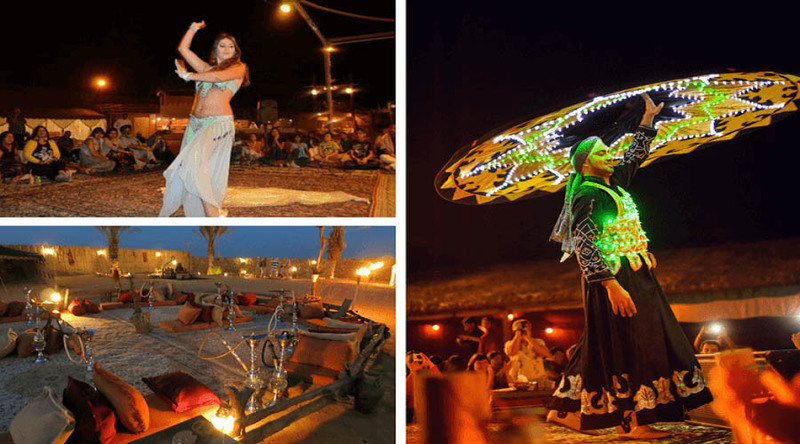 What to Expect at the Desert Safari? Most of the Desert Safari in Dubai promise lot of adventures and numerous entertainment programs. Most of them also include a BBQ dinner right at the desert camp. If you have opted for a morning desert safari, you may be offered an authentic Arabic breakfast. Here are some of the common things that you can expect at most of the Dubai desert safaris. Dune bashing is definitely the highlight of any desert safari. Driven by a professional, the 4×4 vehicle drives over the high and low sand dunes in a crazy way, making it necessary to hold on to your seats tightly. It is nothing less than a roller coaster ride and something all adventure seekers would enjoy. Even if you are apprehensive, you must give it a try. Dune bashing is really exciting and extremely safe. On the other hand, if you are accompanying old people and little children, it would be best to skip dune bashing entirely. Camel is known as the ship of the desert, one of the only vehicles used for trade and transportation in the past by the Arabs. If you want to know how it feels to travel the high sand dunes of the desert on a camel, you get your chance during the desert safari. Usually, camel riding during a regular desert safari is just a short trip, not lasting more than five minutes. While some are satisfied with the duration, most crave for more. If you are one of them, you must go for an exclusive camel riding desert safari where you get to explore the vast desert while riding a camel. The desert camp offers a fair share of adventure sports. Quad biking and sand boarding are two of the adventure sports that you can try during the desert safari. Quad biking is riding an ATV on the desert dunes and sand boarding is like snowboarding but on the sand. The best part is you do not need to have any particular skills to try these adventure sports. Just listen to the instructions by the guides before you try either of them. Sometimes, quad biking and sand boarding are not inclusive of the cost of the desert safari and you would have to pay extra for it. So, make sure enquire about the same during the time of booking. All the adventure sports happen outside the desert camp, while the fun activities happen inside. You can dress in traditional Arabic clothes and pose for pictures. You can also get your hands or legs painted with henna. You would also get the chance to see a falcon show and hold a falcon in your hands. You can also smoke a flavoured shisha if you like to at the desert camp. The last may cost you a little extra but if it is something you would enjoy, you should definitely try it once. Although the desert safari has a lot of thrilling and fun things to do, nothing would eclipse the beauty of the sunset that you would witness in the desert. When it is time for sunset, get your camera ready as this is a sight that you would want to capture forever. The entire desert is coloured in a golden hue, giving the place a surreal look. You would surely have a great time during the desert safari but you would definitely say that this is your best experience. Dinner in the desert is usually BBQ. Most desert safaris usually offer vegetarian and non-vegetarian dishes. While the menu is majorly focused on Emirati cuisine, you would also have a few dishes from international cuisine. You can expect hummus, tabbouleh, kubus, pasta salad, green salad, biryani, lentil or dal curry, noodles, potato wedges, BBQ chicken and fresh fruits for dinner at the desert. If you have any specific requirements regarding food, you must mention the same during the booking and find whether they would be considered while preparing the food. The Dubai desert safari is definitely something you must not miss. However, here are some of the things that you must know before you embark on a journey to the desert. The months between November and March are the best time to go for the desert safari. The days are pleasant and the nights are cooler during these months. Wear comfortable clothes for the desert safari. Carry an overcoat, a shrug or a shawl to keep yourself warm during night time. Wear open-toed sandals or flip-flops. In short, footwear that you can easily remove if sand goes into them. Find what activities are inclusive and for what you would have to pay at the desert camp. This would help you to know how much money you need to carry during the tour. It is best to avoid dune bashing if you are pregnant or have any heart related ailment. Do your research well not only to find the best desert safari operator but also to choose the right desert safari experience. The Dubai desert safari is a unique experience, away from the chaos of the city. It gives you a glimpse into the city’s past when the skyscrapers and luxury did not exist. A desert safari experience in Dubai would never disappoint you. So, book the best desert safari tour today! Imagine dragons, Mandy Moore & Taraji Henson kick off 'Ralph Breaks The Internet' premiere!